Monosaccharides, also called simple sugars, are the basic unit of carbohydrates. They are the fundamental unit of carbohydrates and they cannot be further hydrolyzed to yield smaller carbohydrate units. All monosaccharides consist of a single polyhydroxy aldehyde or ketone unit. Most of the monosaccharides have the empirical formula C(H2O)n. Monosaccharides exists as colourless, crystalline and water soluble solids. Most of the monosaccharides have sweet taste. All monosaccharides are reducing sugars. On the basing of the number of carbon atoms, the monosaccharides may be triose (with 3C), tetrose (4C), pentose (5C) or hexose (6C). Monosaccharides with four or more carbon atoms tend to have cyclic structures in the nature. The scientific nomenclature of monosaccharides is very complex. However, the common names of most of the monosaccharides end with a suffix ‘ose’. The most abundant monosaccharide in the nature is a six carbon sugar called glucose. The oligosaccharides are sugar polymers consist of short chains of monosaccharide units (residues). The monosaccharide units in the polysaccharide chain are linked through a characteristic bond called glycosidic bond. The number of monomer units in the oligosaccharides usually range from 2–20. All oligosaccharides on hydrolysis yield individual monosaccharide units due to the cleavage of the glycosic bonds. The most common oligosaccharides in the nature are disaccharides. A disaccharide consists of two monosaccharide units. The most abundant naturally occurring disaccharide is sucrose (table sugar). 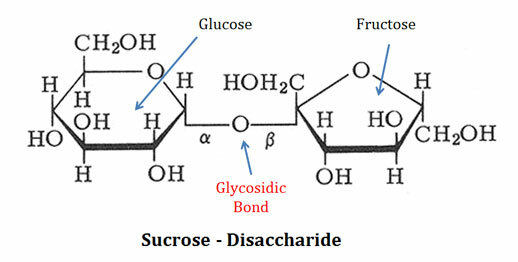 Sucrose consists of a glucose residue and a fructose residue connected through α-1-2 glycosidic linkage. Oligosaccharides with three or more monosaccharide units do not occur freely in the nature. They are usually found associated with non-sugar molecules such as proteins and lipids as glyco-conjugates (Glycoproteins, Proteoglycans and Glycolipids). (1). Homopolysaccharides: They composed of only a single type of monosaccharide unit. (2). Heteropolysaccharides: They composed of more than one type of monosaccharide units. Ø Source of energy: Carbohydrates are the primary source of energy. They are the food reserve (energy store molecules) in microbes, animals and plants. Ø Source of C, H, and O: Carbohydrates also act as the source of C, H and O in the cells for the synthesis of other macro molecules. Ø Sweetener: Some sugars are sweet in taste. They provide sweetness and flavor to a variety of food stuffs. Ø Glycolipids: Carbohydrate containing lipids (called glycolipids) are one of the important categories of plasma membrane lipids. Ø Dietary fibres: Carbohydrates are also the source of dietary fibres. Ø Ribose sugar: A monosaccharide (ribose) is an essential component in the genetic material (DNA and RNA). Ø Cell wall and exoskeleton: Some carbohydrates from the structural framework of the cells. For example, cellulose from the cell wall of plants, Peptidoglycan forms the cell wall of bacterial cells and chitin forms the cell wall of fungi and the exoskeleton of arthropods. Ø Recognition: Some carbohydrates on the surface of cell membrane have recognition role. Ø Protein trafficking: The glycosylation (attachment of sugar moieties to other macromolecules such as proteins) of proteins are used in protein-trafficking by the cell. Example: a protein tagged with mannose 6-phosphate is destined to lysosome. Ø Anticoagulant: Heparin, the anticoagulant of the blood, is a carbohydrate which prevents the blood clotting. Ø Blood group: The ABO blood groups are determined by the carbohydrates and thus carbohydrates also functions as antigens. Ø Industrial uses: Some carbohydrates are the raw material for many industries. Example: cellulose in the paper industry, starch, glucose, fructose etc. in fermentation and brewing industry. Posted in Biochemistry, Carbohydrates, Lecture Notes and tagged Biochemistry Lecture Notes, Carbohydrate Classification, Carbohydrate Functions, Carbohydrates Definition, Carbohydrates Examples, Carbohydrates Structure. EBC IS A WORLD CLASS OF KNOWLEDGE HOUSE. THANK YOU-EBC. I ALWAYS RECOMMEND MY ALL FRDS..
My question is Nitrogen bases are hydrophobic . But what is the benefit of this nature of nitrogen base in nucleic acid. All these hydrogen bonds in DNA are strengthened and protected from solvent hydration by the hydrophobic stacking of the bases, which is a major contributor to the helix stability. Without such protective stacking, the base pairs would rapidly separate and hydrate with solvent water. In conclusion: the usual symmetry, and helical conformation of DNA is maintained due to the hydrophobic nature of bases in the DNA.